Has it really been three months since we posted anything on Dim The Lights? It’s crazy how time flies when you are busy planning your marriage. Yes! Olga and I are finally getting married and it is pretty spectacular. Let’s just say life has been a lovely hurricane of big decisions leading up to our wedding date. So why am I, all of a sudden, writing to you guys? Well, it is no mystery that I love talking about film. What I love even more is seeing filmmakers craft beautiful stories with heart. I was recently introduced to a brand new web documentary called Can I Sing You A Song? 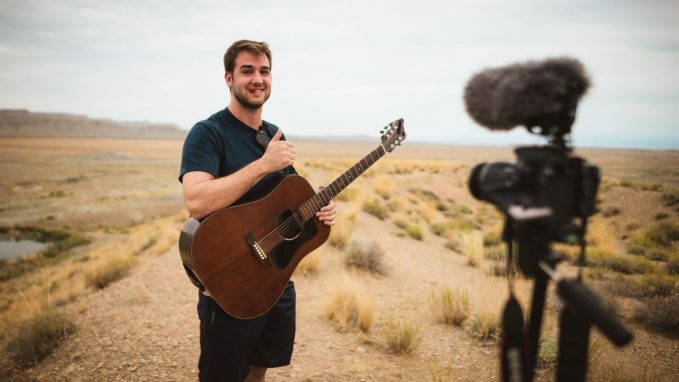 ; chronicling the adventures of Chicago musician, James Moore, as he sings songs to strangers on a 12-day road trip out West. Filmmaker, Jimmy Kurzawa, and photographer, Wade Stofko, join James on this journey as the young trio document this 6-part Youtube experience. James Moore is a singer/songwriter from Chicago. After releasing his debut EP feel, he teamed up with filmmaker Jimmy Kurzawa to develop the idea for Can I Sing You a Song? While you find most local musicians performing on a street corner or at a local venue, James and Jimmy decided to take a more interactive approach. James would engage strangers and ask if he could simply sing a song. Strangers had a choice to hear a serenade, sing-a-long, or a mystery song. Not only was this an idea the pair hoped would boost their careers, but it was also a creative method to connect with listeners. After a successful trial run, James, Jimmy, and Wade took the idea on the road. What started as an interesting experiment has exploded into a novel idea about chasing their “American Dream”. As a creative, I connected with this web series on a deep emotional level. We are a generation of dream chasers, each seeking fulfillment in some unique way not sought after by the generations before us. Jimmy Kurzwawa presents a pleasant “road trip” documentary that sheds light on the lives of these three young creatives. Seeing their successes and failures definitely paralleled some of my own. A musical documentary would not be complete without some great music. James Moore’s sound is extremely catchy and he has some great pipes! There is just something about beautiful music that gets people smiling and that is definitely the winning factor in this web series. Seeing the joy of the listeners James and company encounter is truly remarkable.